One thing I’ve mentioned a few times, is how long it can take between me finishing a project and it seeing the light of day. So, it’s good to be able to finally talk a little about Tribes of Legend , which has just been put up for pre-order on Amazon. ToL is a collection of 3 different games together with painting guides, scenery building, and all the extra gaming goodness you might expect. The setting is the world of the Ancient Greeks, but as they viewed it rather than as you will see in academic texts. This means that armies include drunken centaurs and lithe Amazons as well as the bronze-clad warriors of the city states. Of the three games, one is a mass battle game, one a skirmish between groups of a few warriors, and the last is a solo game in the ethos of the old Fighting Fantasy game books (though it is entirely different rules). Foundry have done a complete new range of models to go with this, and one of the reasons this has taken a while is that it is illustrated with nicely-painted examples of the range throughout. This means that it’s a very pretty book, helped along by rather splendid art alike you see on the cover. The release date is still a bit up in the air (I’m told that Amazon made up the one online). This is because it is on the slow boat from China (literally) as I type. Once it’s arrived and cleared customs then they’ll decide. Soon though. This looks very interesting and has been added to my ever extensive wish list. As you know I love fantasy gaming, but I am especially drawn to ‘Greek’ style humans (Jason and the Argonauts, Clash Of The Titans, 300, etc). To this end I was building a Greek themed army for Mantics Kings Of War and the beauty now is I will be able to use this in games of Tribes of Legends. And a solo FF style game… genius! Congrats on what looks to be another great game, Jake. Looking forward to seeing this in more detail ! 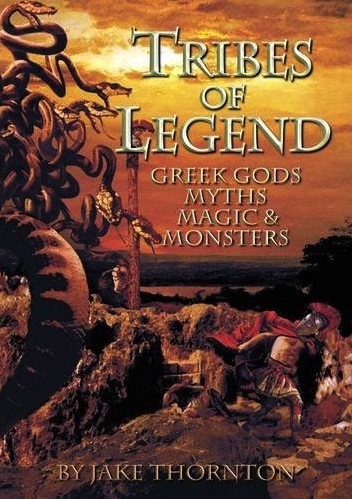 I’ve always thought there were too few good games and miniatures themed around Greek myths. I guess I’d have to say I agreed! Is this the previously hinted mass-battle ruleset? Yes and no, and thank you (in that order). So you have another mass-battle ruleset waiting to manifest somewhere along the line, which may bear some resemblance to this one? I suppose you could say that this mass battle set was, in some ways, a proof of principle as well as a fun game. It deals with a realtively small range of different armies (I can’t recall exactly how many – 5 or 6?) with relatively few troop types in each and so was an easier subject than a full-blown fantasy game. Sounds great – will add this to the Christmas list 🙂 Amazon always make up release dates, a book I’ve edited has jumped around a few times with little reflection of the actual publication schedule! “The need for cunning and deceit” makes it sound interesting…. This sticking to one thing might be harder than I thought. It sounds as though the bit of Condottiere that you would find most useful would be the campaign section. I’m not sure how well that would translate to your particular purpose though. The main game is a mass battle one, and that is quite different from what I understand you are constructing. The set up for recruiting in Condottiere is a relatively conventional points system (IIRC). Tribes of Legend is a very different kettle of fish in many ways. Both may have ideas you could mine. And/or you could wait a little longer for more design discussion. It’s taken longer than I would have liked too, and you’ve been more than patient. Coincidentally, I have most of a post on points systems written that should go up today. So that’s a start. Any comments/summary of game mechanics for the three games? The solo game puts you in the large sandals of the greatest hero of your age, and confronts you with a series of labours or tasks. Each labour can be resolved in more than one way, some more easily with guile than brawn, and each requires you to decide how you will approach it and what you will risk to succeed. Each time you play, the labours are undertaken in a different sequence, making it more tricky to work out which of your limited resources you can spend to overcome them, and what needs to be carefully husbanded for later obstacles. The mass combat and skirmish games are both designed with similar aims. They have easy to remember rules, are very quick to play, avoid long periods of down time for players between moments of action and decision, and these moments frequently offer the players tricky choices. I wanted to make a game where the focus was firmly on what you wanted to do (tactical choice) rather than on how you did it (rules). In terms of ethos these games are slightly old fashioned, concentrating on telling an interesting story and entertaining the players rather than on producing scrupulously “fair” and balanced games for tournaments. Having said that, the mass battle game still includes a points system for producing reasonably balanced armies. Sounds interesting. Not that I need another period or any more figures added to the lead mountain… but it sounds interesting. Yes it does. The world is full of things we don’t need but have anyway. Anyway, your lead mountain is keeping all manner of people employed from the lead miner to me, so do your bit for the failing world economy and buy six! Yep, saving the world economy one miniature a time! Now i like the look of this, you can tell me all about it when you next smash my game plan to bits. Nice one jake all the best with this bud. I’m also intrigued, oddly I was thinking only the other week how cool an ancient greek wargame would be. Look forward to hearing more about it and seeing the new range of models. Pingback: Battle of Greek Legend with Tribes of Legend! As I said on BoW the problem for me at the moment is not wanting to invest in yet another load of models despite a love of mythology and they would fill a hole. Proxy with wood elves maybe? So foundry are also bringing out some of the mythical greek monsters? The skirmish game it what appeals – what size board do you need? I’m not entirely sure what the final incarnation of the range includes, other than most stuff. There wasn’t anything I recall asking about that wasn’t in the range already.